Send them their own deli counter. When I’m away from Ann Arbor for more than a few days, I start to miss food from Zingerman’s. Coffee and bread first, then more subtle longings loom. Top among them are our cured and cooked meats. This is a collection of my favorites from our richly stuffed deli case. It’s good grub for weekends, when cooking takes time away from more important leisure matters. Just set out some cheese, vegetables, bread and some slices of ham and salami for a satisfying feast. 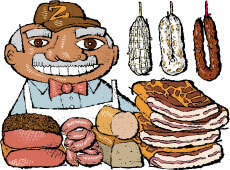 Our Zingerman's yellow gift bag includes a pound each or thereabouts of our Classic Black Angus Lean Corned Beef, Pastrami, Broadbent's Kentucky Breakfast Sausage, Usinger’s Liverwurst, and Applewood Smoked Bacon, plus La Quercia's Prosciutto Americano and Borsellino Salami. Around six pounds of cured cow and hog, rounded out with a loaf of Peppered Bacon Farm Bread. Requires a strong will not to overdo it. (In case of excess, we’ll throw in some Alka Seltzer.) Everything freezes splendidly.